Bonn – Germany. Sunday, 21 January 2018: (An analysis in German.) A narrow majority of 56% of the delegates of the center-left Social Democratic Party (SPD) has agreed to start negotiations about the continuation of the currently ruling “grand coalition” with Merkel’s center-right Christian Democratic Union (CDU) party. After those negotiations all SPD party members will have to vote on a potential government contract. It therefore will take still substantial time until Germany may return to a stable government. While doing economically very well and being the respected leader of Europe, the continent’s largest economy will probably be without a formal government for at least half a year since the last elections. 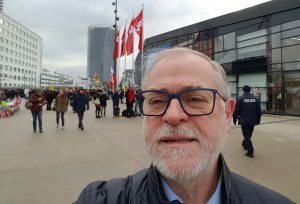 GLO President Zimmermann in front of the conference center in Bonn close to river Rhine observing the event.